â8-16 business days you will receive your purchase, fashion, new 100% guarantee your satisfaction. 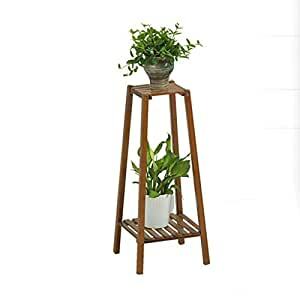 â The original bamboo production, smooth and smooth, durable, high stability, with good carrying capacity. â Smooth rounded craftsmanship, protects your hands, molds, sturdy wooden feet, and durable. â patience polished, environmentally friendly varnish, no burr, smooth foot, quality as one. Scope: living room, bedroom, study, balcony. Fashion, personality, solid and solid. Durable, practical and convenient, environmentally friendly. Removable plant rack, when not used to fold, super saving space design. Common features: Multi-layer design to further enhance the versatility of the shelf. First scrub with a damp cloth, and then dry with a dry cloth.